Today when I saw her post, my jaw dropped! So I set myself up to CASE her creation. Now Anne's is a tag and envelope. Mine is just a card. Did I say, "just"? Well, it's too beautiful a project to announce is at simply "just" anything. You be the judge. 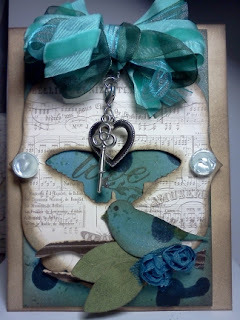 Below I am showing off the lovely Stampin' Up! charms I've added to my project. Below I am highlighting the lovely bird and charms along with the sweet fabric roses. To begin my project I took Very Vanilla cs and spritzed it with alcohol mixed with Marina Mist and Island Indigo ink and some Frost White shimmer paint. Then I used a paint brush dipped in my inks and tapped all around the cs. I then cut that piece of cs down to 3 1/2" x 5 1/4". I distressed with edges with some Soft Suede ink. Then I used the 2nd to largest SU Labels Collection Framelit and cut the music dsp. 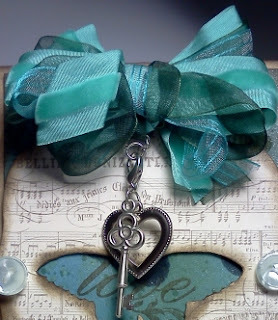 Then I stamped with butterfly from SU Strength & Hope set (if you have a butterfly die, USE IT) and craft cut it out of the center of my music paper. I distressed the inner and outer edges of the music paper with more Soft Suede. 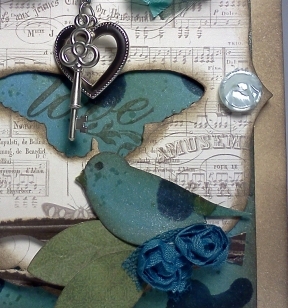 My base card blank is Very Vanilla and I distressed it as well with the same Soft Suede ink. Bird was punched from the spritzed paper using SU Bird Builder punch and the leaves were punched from SU Blossom Builder punch. I put a piece of the Co'ordniations Early Espresso through my Big Shot with the Woodgrain EF, then I fussy cut it into a branch. The little blue flowers are NEW to Stampin' Up! They are item #126869 pg 5 in the new Seasonal Mini catty. They come in white. I used my Spritzer with the inks and spritzed til I had desired coverage. Love em!